There is much potential for Manus to become a major fisheries hub and in turn generate substantial revenue and jobs for the island province and the country. A high level delegation led by the Minister for National Planning and Monitoring, Hon Richard Maru, visited the proposed industrial site N’Drahukei on the West Coast of Manus Island on Sunday (22 October 2017) to learn more about its prospects. N’Drahukei consists of 260 hectares of unused State land. The delegation also included the European Union Ambassador, H.E. Ioannis Giogkarakis-Argyropoulos, National Fisheries Authority Managing Director, John Kasu, Speaker and Manus MP Job Pomat, Governor for Manus, Charlie Benjamin, and representatives from PNG Power, Water PNG, and Telikom PNG. Minister Maru said Manus province will soon see a fall in the K25million revenue it has enjoyed in the past after the closure of the Regional Processing Centre at the end of this month. “This means that jobs will be lost and small businesses will also make losses. Therefore, the O’Neill-Abel government is keen to ensure the people of Manus are supported through sustainable projects like a fisheries and cannery project. Your greatest asset is the sea,” Minister Maru told the local coastal community. Manus Island is 5th largest island in Papua New Guinea and is the largest of the Admiralty Islands. It is surrounded by the Bismark Sea and naturally its waters are littered with vast marine resources. Minister Maru highlighted that the European Union has a population of about 500 million. “They are the richest region in the world and they provide a massive market for our fisheries products,” Minister Maru said. He added it was time the national and provincial governments became partners in business such as those in the fisheries sector. EU Ambassador, Ioannis Giogkarakis-Argyropoulos, said his visit was to learn as much as he could about Manus. “I think it is necessary to bring Europe over to Papua New Guinea and I will try hard with the Minister and the Trade Minister and other Ministers, Governors and the Private Sector. Papua New Guinea has potential in fisheries. There is a need and there is potential to bring investors also because Europe brings standards. It is true that the European Union is a big market for fish and tuna in particular of Papua New Guinea. It is also true that the European Union has been a partner of Papua New Guinea for over 40 years now, which also include trade and economic cooperation,”Ambassador Ioannis said. 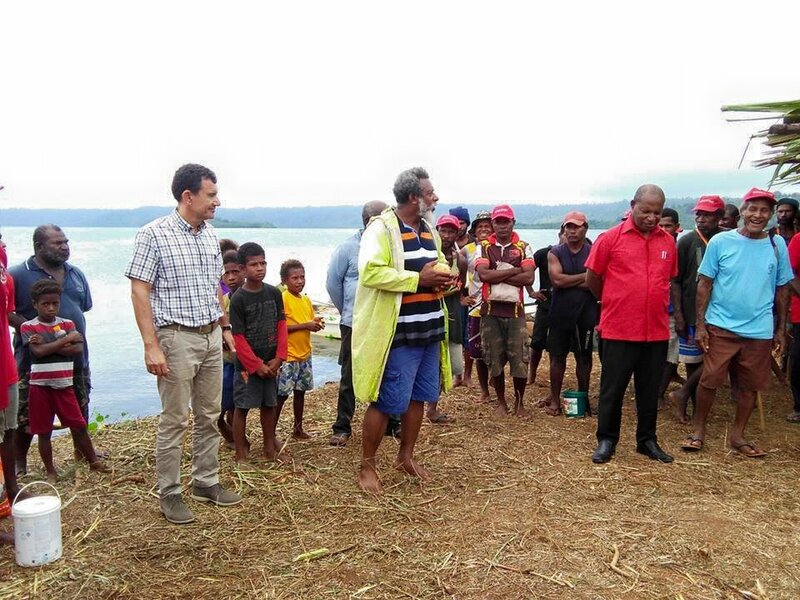 Governor Charlie Benjamin said the Manus Provincial government wants to see a fisheries project established in the Province at N’Drahukei. Speaker and Manus MP, Job Pomat,said if the Solomon Islands had a cannery on a remote island far from the capital Honiara, why not Manus for Papua New Guinea? Currently all the fish caught in the waters of Manus are sent abroad and none of it is processed locally. One of the country’s best fishing grounds is located some two to three-hour steaming time from N’Drahukei. “It would make sense if a processing plant was set up there to attract not only PNG flagged fishing vessels but many other vessels that are fishing in the high seas to come to Manus for their supplies. It would bring businesses to Manus where anglers can buy water, shop for goods and they can come for rest and restoration in Manus which is very close to the fishing grounds,” Minister Maru said. After this visit the Government will look at engaging an independent consultant through the NFA,Department of National Planning and Monitoring and Department of Trade, Commerce& Industry, to conduct feasibility study on the viability of the project.